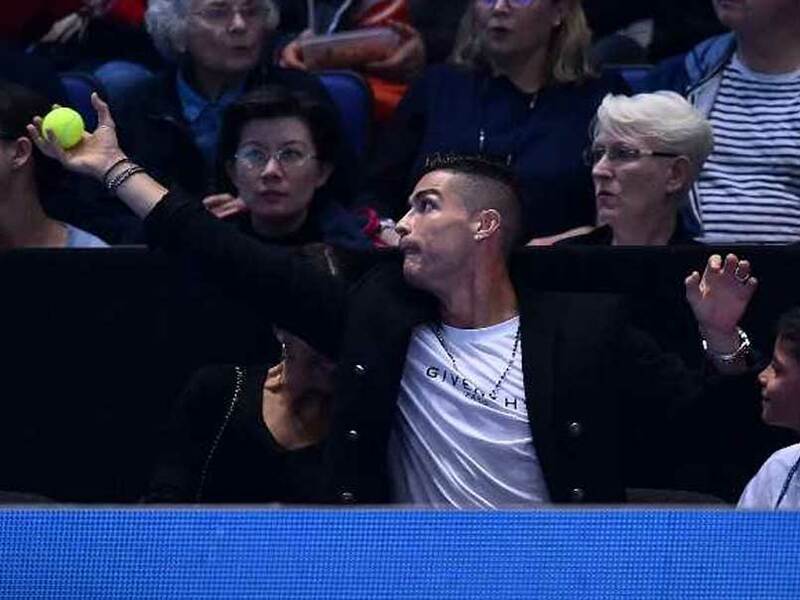 Cristiano Ronaldo, who recently led Juventus to victory against a 10-man AC Milan in the Serie A, was spotted enjoying an ATP Finals contest between World No. 1 Novak Djokovic and American John Isner at the O2 Arena in London. Accompanying him was his girlfriend Georgina Rodriguez and son, Ronaldo Jr, who is also making a name for himself as a kid footballer. The cameras panned at Ronaldo the moment he tried to catch the tennis ball flying in his direction. The ball slipped out of his hands, and hit his girlfriend Rodriguez on her head. Against AC Milan, Ronaldo scored in the 81st minute as Juventus bounced back from their midweek UEFA Champions League defeat by Manchester United. It got the defending seven-time Serie A champions back on track after suffering their first defeat of the season by United following two late goals despite Ronaldo's stunning volley. Juventus have 34 points from 12 games -- six ahead of Carlo Ancelotti's Napoli with Inter a further three behind. "I'm very happy, especially for the team, because playing away to Milan is always very difficult. "It was important to win, because Napoli beat Genoa last night and we had to keep our distance." said Ronaldo. Cristiano Ronaldo led Juventus to victory against AC Milan on Monday. Ronaldo was accompanied by his son and girlfriend Georgina Rodriguez. Video featuring Ronaldo was posted on ATP World Tour's Twitter handle.